Pouch Laminating Machines come in a variety of sizes depending if you are going to laminate something as small as ID's to something as large as menus. Multiple silicone heated roller designs help with the laminating of photographs and ensure a crystal clear thermal lamination. We offer cost efficient pouch lamination models as well as high end ultra quality and high speed pouch laminating machines. Usually the difference in cost is if the pouch laminating machines offer speed or temperature controls, amount of laminating rollers, top speed in which pouches will be laminated, the highest mil that a pouch laminating machine can handle as other values such as internal metal gears or build quality. All of our Pouch laminators are thermal but some have the option to run cold for cold laminating pouches, other have the ability to adjust speed & heat to fine tune the pouch laminating process. Pouch Laminators are also used to apply foil or adhesive backs because of the even pressure they apply. Always be careful to avoid any adhesive touching the inside of the machines. 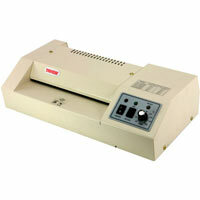 Commercial duty, carrier free 6-1/4" pouch laminator. 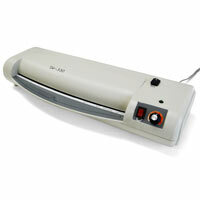 Provides easy and professional laminating of documents up to 6" wide. Commercial duty, carrier free pouch laminator. Allows production laminating up to legal size at an economical price. 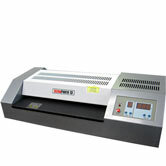 The SM 330 Pouch laminator is a high quality photo pouch laminator with advanced heated roller design. It laminates pouches from 3 mil to 10 mil easily with professional results. The rollers turn on separately to extend the life of the machine. You can laminate small things like business cards all the way up to documents as large as 12" x 18"
The HRPL330 13" Photo Pouch laminator is an affordable commercial duty pouch laminator that utilizes an advanced heated roller design. 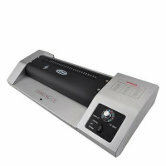 This design allows the laminator to produce professional results with even hard to laminate documents. It is perfect for laminating ID size pouches up to 12" x 18" documents. 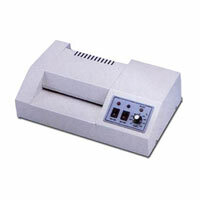 ML 13 Commercial duty, carrier free pouch laminator. The ML 13 Pouch Laminator allows production laminating of up to menu size pouches at an economical price. The Ultra Photo 13 photo Pouch laminator produces crystal clear laminated documents every time. It laminates up to 10mil thick and 13 inch wide documents at one of the the fastest lamination speed on the market. It is rated as industrial duty and has 6 rollers (4 heated) that are driven by durable metal gears. Features 18" throat for documents up to poster size. Heated roller design provides exceptional quality on photos and other glossy stock. The Speedy-Lam 330R-10 10 Roller Pouch Laminator is the fastest pouch laminator on the market today.Armed with 10 rollers, 6 of which are heated, the Speedy-Lam 330R can laminate up to 15 letter size Laminating pouches in 60 seconds!